My childhood home at Oxtongue Lake holds a very special place in my heart, and we visit there often. Every season has something special to offer and to excite Bob and me. 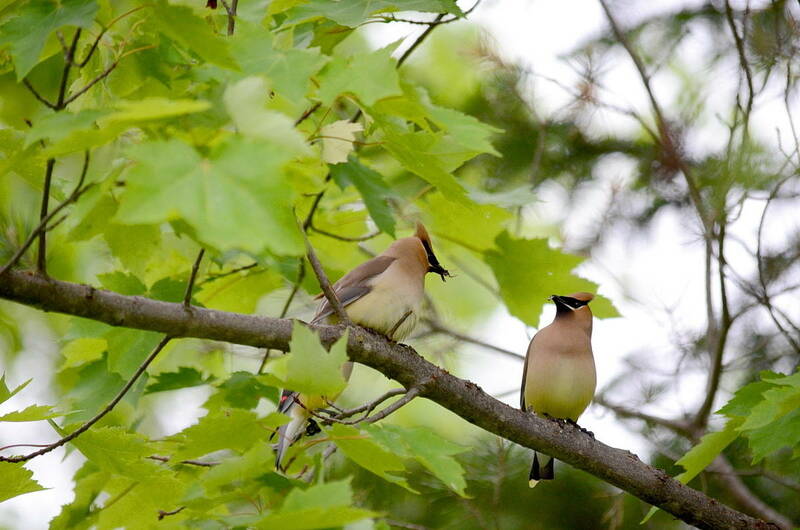 In early June, it was the nesting pair of returning Eastern Bluebirds that first captured our attention, but with expansive views from mom’s sunroom windows, we saw at least a dozen other species of birds including four pairs of Cedar Waxwings. 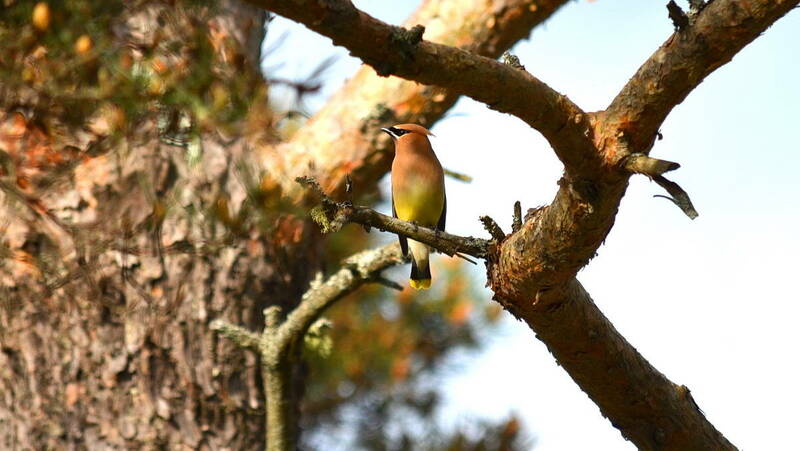 It was late one afternoon, as we studied the vicinity of the bluebird nest box for signs of that pair, that I saw an unexpected Cedar Waxwing alight in one of the old pine trees. At first, I thought it was a lone bird, but then I noticed that there were at least three others perched in the branches. 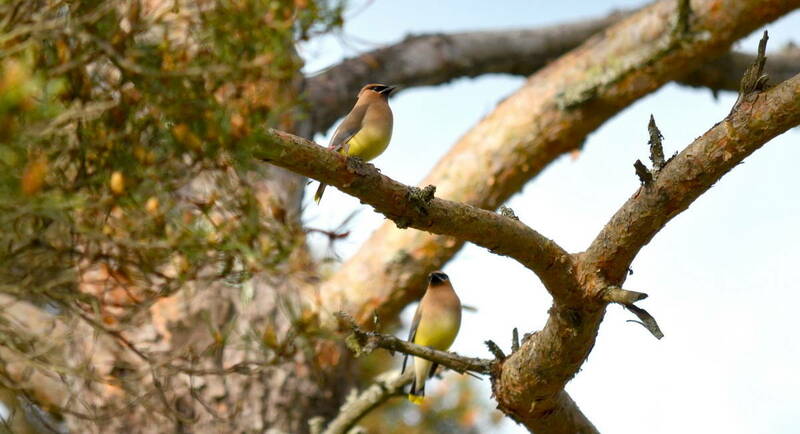 It was exciting to note that the Cedar Waxwings were paired up and engaged in active courtship display. The pairs seemed to favour one pine tree in particular and for no other reason that I could see but the late afternoon sunshine that was bathing the tree in warmth. The pairs kept jockeying for space where the sunlight penetrated through the foliage. 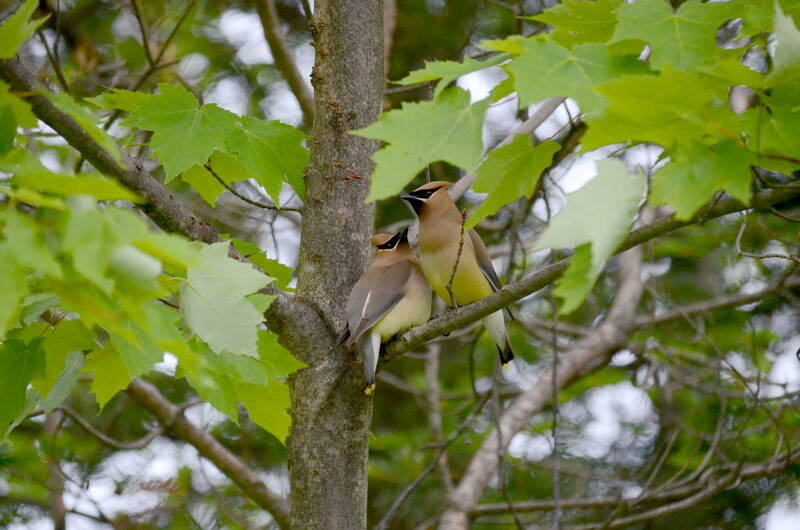 This was all very exciting because mom indicated that she and dad had had Cedar Waxwings nest in their cedar hedge many years ago, and the behaviour of the birds certainly indicated that they were getting ready to begin mating. 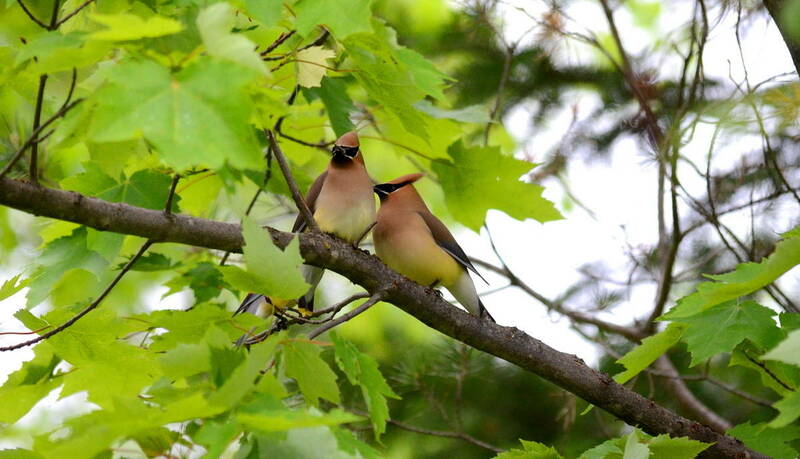 The following evening, when Bob and I went for a walk, we saw again eight Cedar Waxwings land in the crown of a neighbour’s spruce tree, so we knew the birds were still in the area. 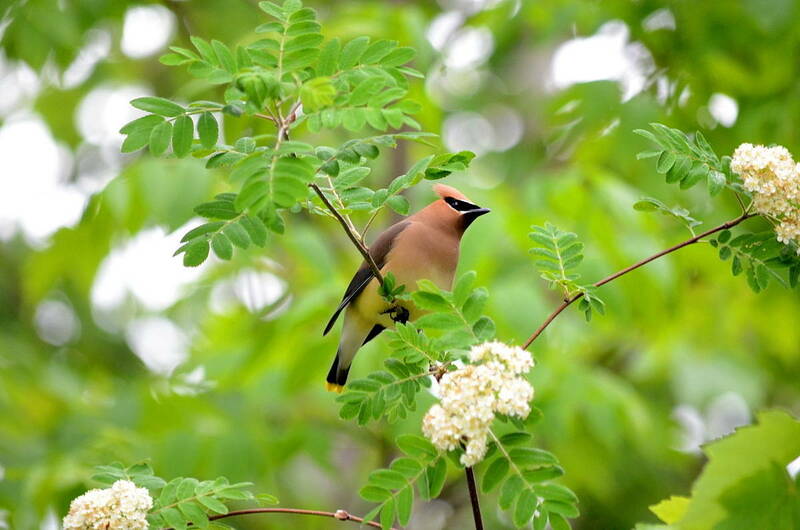 While steadying a ladder for Bob another day, so that he could clean out a long-neglected apartment for swallows, he noticed a Cedar Waxwing light on a Mountain Ash sapling right beside us. I hate to say it, but I had the camera around my neck ready for anything that might show up. My daughter-in-law says it has become our fifth limb, and she is pretty much right. Anyway, I left Bob to his own means of steadying his perch and bolted a few feet to try to snap a photo. 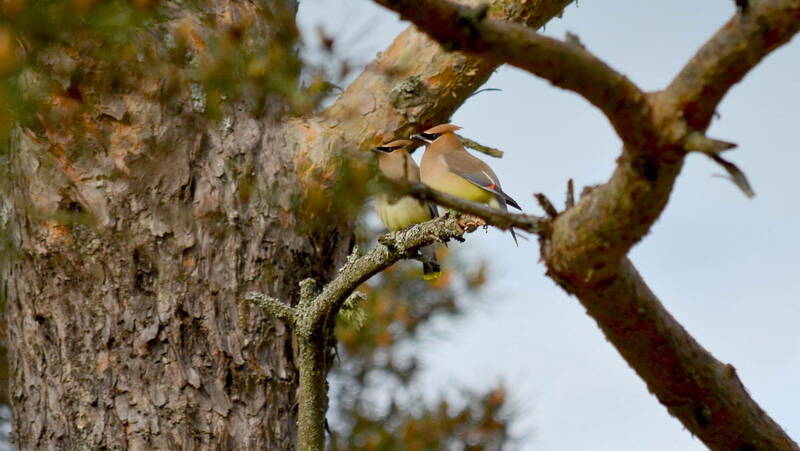 That’s when a second Cedar Waxwing showed up and began foraging for food. 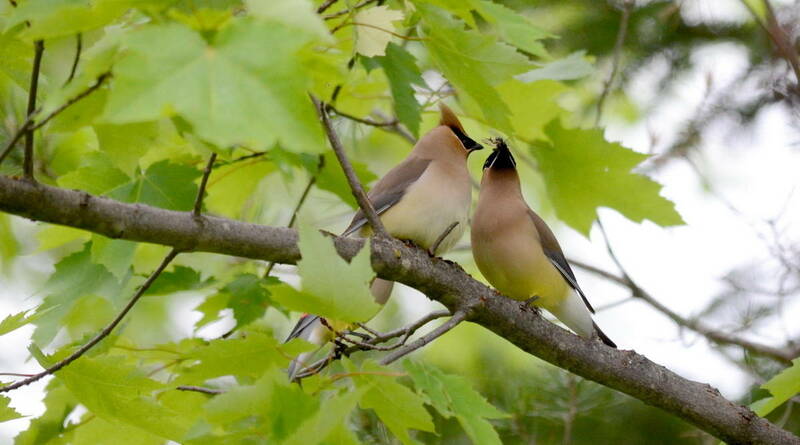 As its mate waited for the subsequent offering, a third Cedar Waxwing flew in as if to compete for the one bird’s attention. 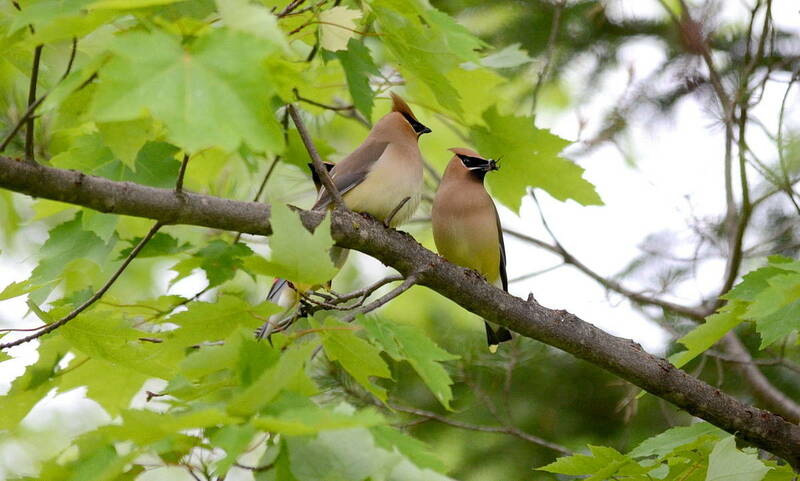 A second pair of Cedar Waxwings in an adjacent maple tree was similarly preparing to pass back and forth the insect offering that bristled in the beak of the male Waxwing. 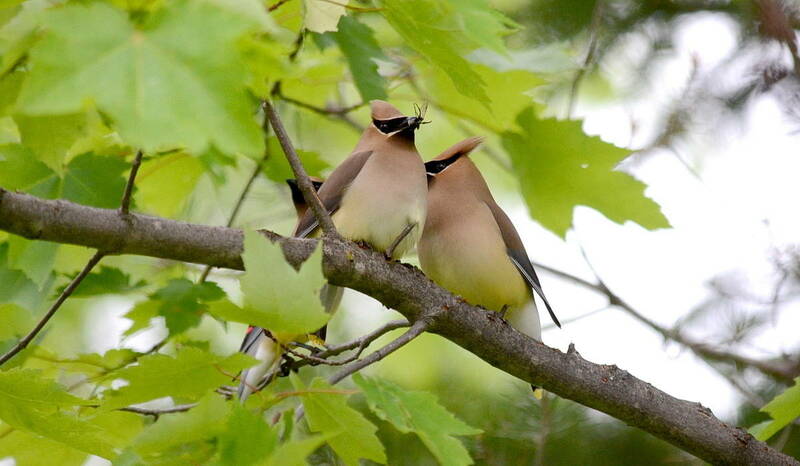 This is the courtship routine that is performed by both the male and female of the species. 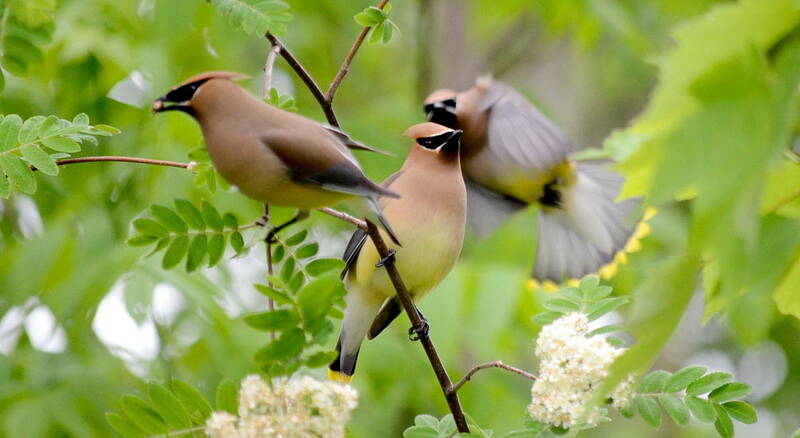 The Cedar Waxwings take turns hopping back and forth towards one another, often touching bills when they meet. A male will offer a tidbit to its mate, perhaps a flower petal, an insect, or a small piece of fruit. The female will accept the offering, then hop a short distance away. Within seconds, the female will close the gap between she and her mate and pass the delicacy back to him. This practice will be repeated several times until finally the female of the pair will swallow the morsel. 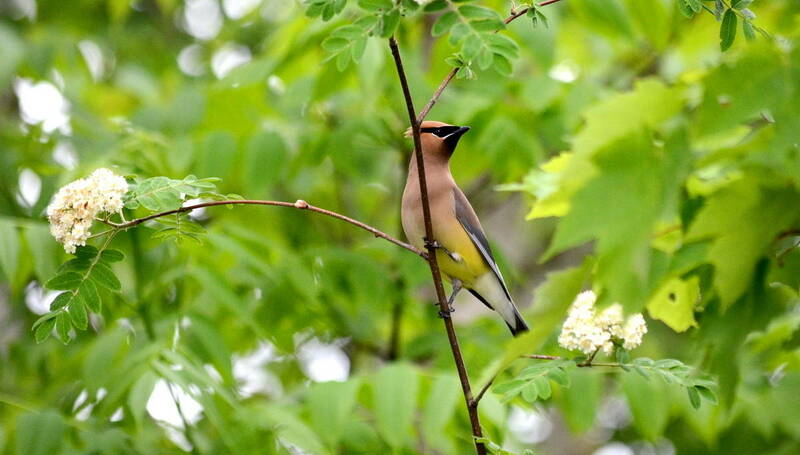 Cedar Waxwings are among some of the latest birds to nest each spring because their main food source is fruit. The availability of fruit in their breeding grounds requires that this species waits until mid-summer to breed and nest so a bountiful source of fruit is available. 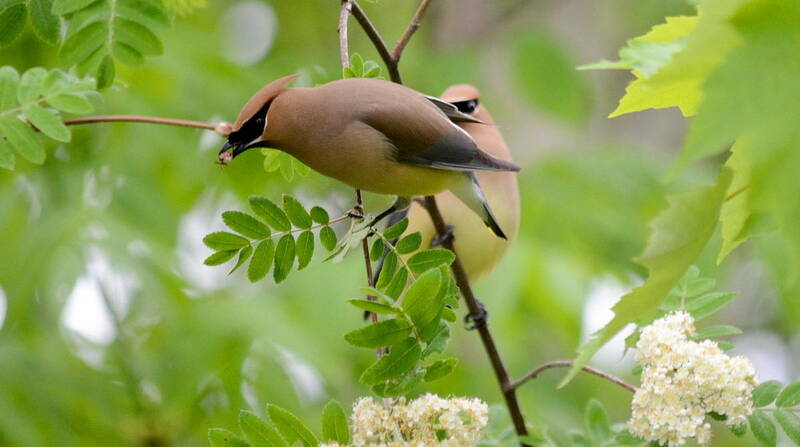 Even during winter months, they consume a diet almost totally made up of fruits like Mountain Ash berries or Cedar berries, which gave rise to the name of this bird species. We felt really lucky to have witnessed their courting routine.